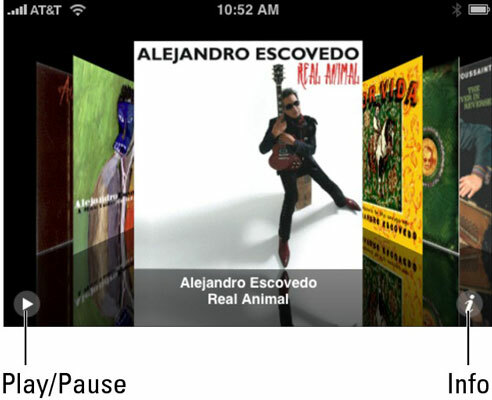 You can find music on your iPhone by using the Cover Flow feature. Cover Flow lets you browse through your music collection by its album artwork. To use Cover Flow, turn your iPhone sideways (that is, long edges parallel to the ground). As long as you’re not browsing the Internet or viewing video (and, of course, you’ve tapped the iPod icon on the Home screen so that your iPhone behaves like an iPod), Cover Flow fills the screen. Go with the Cover Flow. To see the tracks (songs) on an album, tap the cover when it’s centered or tap the info button (the little i) in the lower-right corner of the screen. The track list appears. To play a track, tap its name in the list. If the list is long, scroll by dragging or flicking up and down on it. To go back to Cover Flow, tap the title bar at the top of the track list or tap the little i button again. To play or pause the current song, tap the play/pause button in the lower-left corner. If no cover art exists for an album in your collection, the iPhone displays a plain-looking cover decorated with a single musical note. The name of the album appears below this generic cover.